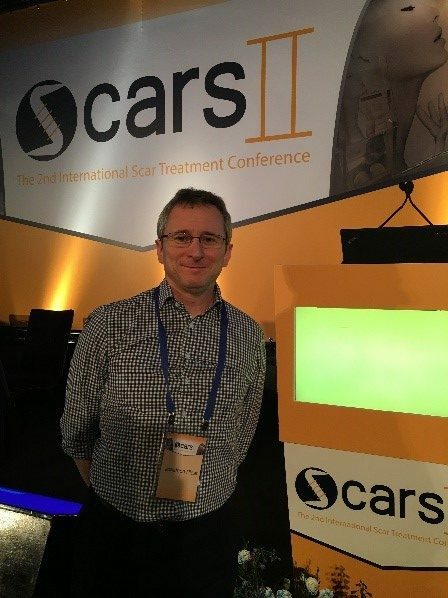 On 21st-22nd March 2018 Mr Jonathon Pleat, deputy director of research at Restore, attended the 2nd International Scar Treatment Conference, Scars II, in Tel-Aviv Israel. Last year’s conference was attended by worldwide known speakers in the field of scar remodelling and prevention and this year’s conference was no different. The focus of the two-day conference was on the multidisciplinary treatment of scars and to elaborate on the existing progress in the field. Ground-breaking concepts for scarring were discussed by top researchers, including Gerd Gauglitz, Dr Gill Waible, Dr Geoffrey Gurtner and many more. The programme was divided into 8 sessions, each containing multiple talks and workshops by a variety of cutting-edge speakers. The sessions included: Scar Formation; Scar Mitigation; Medical Management of Scars; Procedural Management of Scars; Lasers and Light Devices in Scar Management; Acne Scars and Striae; Special Considerations and The Future of Scar Management. The use of injectables for the treatment of hypertrophic scars and keloids by Gerd Gauglitz. Alleviating pain and itch in burns by William Norbury. The use of Fractional Ablative Lasers to vaporize old burns scars and create a wound that results in new healing by Dr Gill Waible. Radiation in the treatment of keloids by Brian Berman. Fat Grafting and cell based therapies as a procedure for the management of scars by Dr Geoffrey Gurtner. The freezing of scars from the core using intralesional cryotherapy- a procedure to improve the appearance of hypertrophic scars and keloids by Yaron Har-Shai. Scarless wound healing- Is it possible? By Geoffrey Gurtner. The conference was a great success and provided a fantastic platform to increase awareness of advanced scar management techniques.